Drawing on her life’s work of teaching and researching in urban schools, Bettina Love persuasively argues that educators must teach students about racial violence, oppression, and how to make sustainable change in their communities through radical civic initiatives and movements. She argues that the US educational system is maintained by and profits from the suffering of children of color. Instead of trying to repair a flawed system, educational reformers offer survival tactics in the forms of test-taking skills, acronyms, grit labs, and character education, which Love calls the educational survival complex. 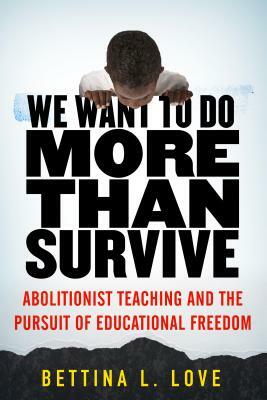 To dismantle the educational survival complex and to achieve educational freedom—not merely reform—teachers, parents, and community leaders must approach education with the imagination, determination, boldness, and urgency of an abolitionist. Following in the tradition of activists like Ella Baker, Bayard Rustin, and Fannie Lou Hamer, We Want to Do More Than Survive introduces an alternative to traditional modes of educational reform and expands our ideas of civic engagement and intersectional justice. Bettina L. Love is an award-winning author and an associate professor of educational theory and practice at the University of Georgia. Her research focuses on how teachers and schools working with parents and communities can build communal, civically engaged, antiracist, antihomophobic, and antisexist educational, equitable classrooms. A sought-after public speaker on a range of topics, including hip-hop education, Black girlhood, queer youth, hip-hop feminism, art-based education to foster youth civic engagement, and issues of diversity, Love has also provided commentary for news outlets including NPR, the Guardian, and the Atlanta Journal-Constitution.